So bedazzled were Cape Verde’s first Portuguese settlers in 1460 that they christened the archipelago’s third largest island ‘Boa Vista’, which translates as ‘beautiful view’. With the launch of direct flights to Boa Vista from London Gatwick and nine other European cities this month, Cape Verde’s most breathtaking island is now within easy reach. Strung out like a necklace across the Atlantic some 350 miles off the west coast of Africa, the Cape Verde islands enjoy a similar climate to the Caribbean but without the hurricanes. In fact, the island of Boa Vista is so blessed with sunshine that the annual number of rainy days can be counted on just one hand. And being only one hour behind GMT, jet-lag, the scourge of many a winter holiday, is non-existent. Home to some 60% of Cape Verde’s legendary powdery white beaches and fringed with tropical, turquoise seas, rich in marine life, Boa Vista is the perfect winter getaway. Those looking for a switch-off will find the laidback Cape Verdean pace of life almost horizontal. The Creole locals refer to it as the morabeza. 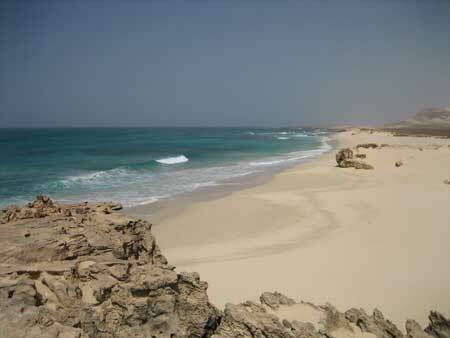 Thomson (0871 231 4691; www.thomson.co.uk) offers weekly flights from Gatwick to Boa Vista from £249 return including taxes. The 5½-hour direct flight departs on Fridays at 10am, returning to Gatwick at 10.25pm the following week. A taxi from the new international airport to the island’s capital, Sal Rei, costs around £5 and takes ten minutes. Nowhere else is Boa Vista’s morabeza more in evidence than the quirky Hotel Spinguera (www.archipelagocapeverde.com, 01768 775 684). This abandoned fishing village has been restored into a delightful boutique hotel of 12 separate residences. Located on a deserted beach at the end of a dirt track and with no TV, mobile or internet coverage, it feels cut off from the rest of the world. Doubles from £135 per night B&B. Rising up from a breathtaking four-mile beach like a giant sandcastle, the four-star Hotel Riu Karamboa (www.thomson.co.uk, 0871 231 4691) only opened its doors a couple of weeks ago. This 750-room resort on Praia de Chaves is the largest hotel in Cape Verde and comes with pool, spa and four restaurants. Prices from £532 pp per week all inclusive, with direct flights & transfers. Further along the coast, and spread out along a dramatic escarpment above the beach, is the Venta Club (www.capeverdeexperience.co.uk, 0845 330 2047), an Italian-run hotel offering all-inclusive family-orientated holidays. Activities include tennis, gym and archery. Prices from £849pp per week B&B, with flights (via the neighboring island of Sal) and transfers. The Migrante Guest House (www.capeverdetravel.co.uk, 0845 270 2006) is a recently converted colonial building in the old quarter of sleepy Sal Rei. The sun loungers in the courtyard under the shade of the date palms are the perfect place to escape the midday heat. The bar is one of the best on the island. Doubles from £40pp including breakfast and airport transfers. The vast majority of Boa Vista’s 4,000 residents live in the pretty town of Sal Rei, where the morning spectacle of the local fishermen bringing in their catch is well worth seeing. The rest of Boa Vista is sand, date palms, extinct volcanic peaks and more sand. The best way to explore the deserted beaches and dramatic interior of ‘the island of the dunes’ is by quad-bike. A half-day excursion with Quad Land (www.quadland-boavista.com, 00 238 992 7306) costs £15 and takes in the 12-mile-long sweep of Santa Monica, a regular in “Top Ten Beaches of the World” polls. An all-day session (£24) includes a visit to the hulking shipwreck of the Santa Maria, a Spanish freighter carrying garlic, car parts and pornographic magazines which run aground on Boa Vista’s north coast in 1968. One of the many bars along the glorious Estoril Beach, while you watch the windsurfers and kite surfers skimming across the sheltered waters of the Baia de Sal Rei. The Italian-run Tortuga Beach Bar (00 238 993 0811) serves omelettes and pizzas for about £6. The Bahia Beach Bar further down the coast (00 238 991 8663) is set on one of the most beautiful stretches of beach in Cape Verde. The speciality is locally-caught fish and chips (£8). The beach-front sun-loungers and umbrellas will tempt those who enjoy a post-lunch siesta. Doing one of the many watersports along Estoril Beach. Cape Verde is one of the world’s top kite surfing and windsurfing destinations and hosted the windsurfing World Cup in 2007. Run by former French windsurfing champion Francois Guy, the Boa Vista Wind Club (www.boavistawindclub.com) organises lessons for all abilities. The bay is completely protected by the Ilheu de Sal Rei and the tropical waters are never more than 2 metres in depth, making it an ideal spot to learn. Private 2-hour lessons cost £45. Other activities on Estoril Beach include diving and kite surfing (contact the Brazilian-run PADI-registered Submarine Dive Centre and Kitesurf Club, 00238 992 4865), big game fishing, horse-riding and humpback whale watching (February to May are the best months). The ruins of the Duque de Braganca fort on the Ilheu de Sal Rei, the uninhabited island overlooking town. The 200-year old fort was built to defend Sal Rei from pirate attacks and the old iron cannons and stone walls are well preserved. To get to the island, you’ll need to pay a local fisherman about £10 to take you there. It takes an hour to walk all the way round the island. One of the most exhilarating walks in Cape Verde begins in Sal Rei and follows the impossibly beautiful talcum-powder sands of Praia de Chaves south to the nineteenth-century brick works, now semi submerged beneath the dunes. A hand-carved turtle from the African market in the main square in Sal Rei. Boa Vista is home to the world’s third largest loggerhead turtle nesting beach and the turtle is the symbol of Cape Verde. Casa Luisa (00 238 994 2098), A friendly Italian-run pizzeria close to Estoril Beach serving a traditional variety of Italian pizzas and vegetarian dishes. Pizzas from £7. Blu Marlin (00238 251 1099) on the main square in Sal Rei, specialises in Cape Verdean dishes, particularly locally-caught seafood. The wine list is extensive. Main courses from £12. Grill Luar (00 238 251 1730) at the north end of town. The climb up the four flights of stairs is well worth the effort for the sunset views over the harbour. Main courses from £8. Cape Verde is a melting pot of African, Brazilian, Portuguese and Caribbean cultures, and dancing is the national pastime. The Mizurca nightclub on the outskirts of town gets going from about 1am and is heaving at weekends, playing 100-decibel house music until sunrise. The sandy coves and rock pools behind Rochinha, a rocky hill ten minutes walk north of Sal Rei. The locals come here at weekends to swim and play volleyball. Quad-biking across the Sahara-like Deserto de Viana without carrying enough drinking water. For further information about Boa Vista, visit www.boavistaexperience.com, a website dedicated to tourism on the island. Tom Avery is one of the UK’s foremost explorers.